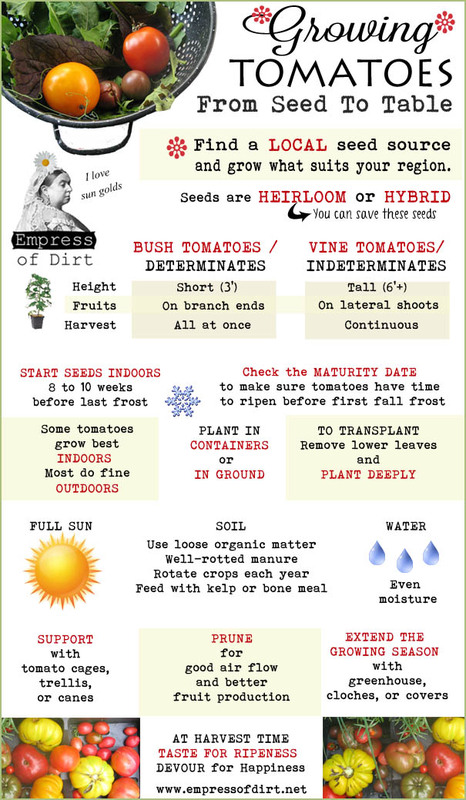 How to grow tomatoes from seed to table including a handy chart showing the types of tomatoes and where to grow them. 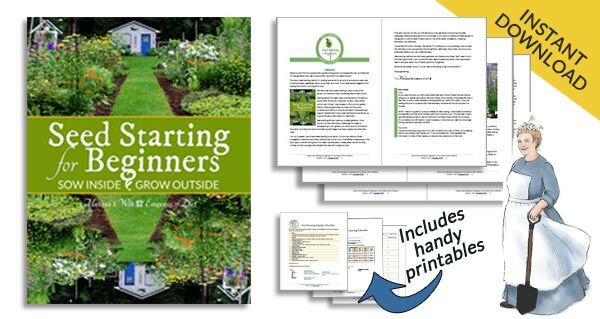 Tomatoes need warmth to flower and ripen the fruit, so start your seeds early or buy starter plants. 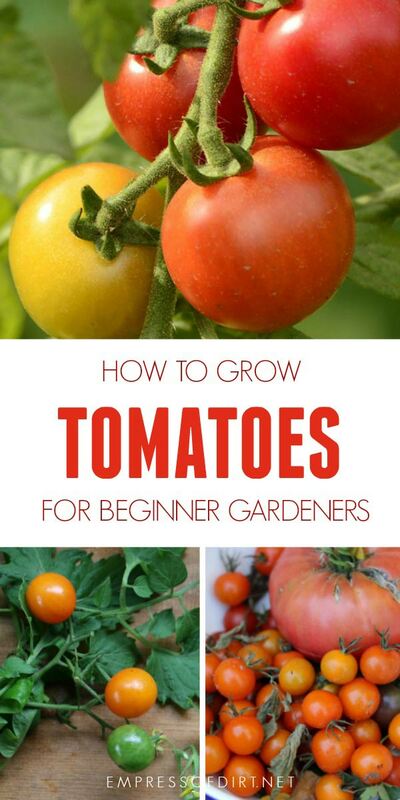 This is the first part of a series on 5 Best Tips for Growing Tomatoes. Why grow our own tomatoes? Taste and variety! Supermarkets are supplied with tomatoes that have uniform appearances and travel well. If that doesn’t sound delicious, you’re right! There are hundreds of tomatoes to grow—both heirlooms and hybrids—in all sorts of colours, qualities, and flavours. When you’re growing from home, taste comes first. Try out a few new types each year and develop your own list of favourites. It’s important to note that hybrid tomatoes are not GMOs and there are many wonderful varieties of hybrid tomatoes. Hybrids are unlikely to breed true to the parent plants so seed saving from hybrids is generally not worthwhile. Because of this, many gardeners will buy hybrid seeds and save heirloom seeds. The definition of heirlooms varies, but, in general, it’s a tomato seed that has bred true for several decades or more: what you plant is what you get. Determinate, or bush types, bear a full crop all at once and reach a specific height. Determinate tomato plants start to die after fruiting. Indeteriminates grow as vines and provide ongoing ripe fruit beyond the first harvest. Indeterminates are “tender perennials”. Some greenhouse growers say their vines live as long as three years if conditions are right (no frost, good light, etc.) and can grow to tremendous lengths (16 feet+). I let the vine continue fruiting until fall frosts kill them off. Semideterminates grow like bushes the way determinates do, but can produce a second crop. I grow just one of these: Roughwood Golden Plum. There are over a thousand types of tomatoes (both heirloom and hybrid) and they can grow as bushes (“determinate”) or vines (“indeterminate”). Most heirloom tomatoes are indeterminates (grow as vines). It’s helpful to check which type you’re growing so you know how big it will get, how to support it, and how long a harvest to expect. Not all companies list this information on the seed package or plant tag but you can always find the information online (see Cornell database below). If you grow several types, you can have tomatoes for fresh salads as well as preserving (canning, freezing, dehydrating). For many of us, our warm growing seasons are short so we have to start our tomatoes as soon as the warm weather arrives. Days to maturity is important for tomatoes because that tells us how long we need to grow the plant either from seed or transplant to harvest time. When choosing seeds or plants, picks ones that fit your timeline. en. My average last frost date is around May 9. My average first frost date is around October 8. That provides 152 frost free days which is plenty of time for growing tomatoes. although cool or drab summer weather can really delay growth and ripening. The tomato growing season can be extended by offering weather protection in the form of a greenhouse, polytunnel, cloches, or covers. This will buy you more time in the spring and fall. Did you know that in 1883 the Supreme Court of the United States decided that the tomato, although botanically a fruit, is used as a vegetable, and therefore should be classified as one? Read it here. It’s all about taxes, of course. I start my tomatoes from seed indoors under the grow lights in March and April. Here’s my grow light setup. I harden them off (get them used to being outdoors) in the covered patio area for about two weeks before planting them out in pots in May. I like growing them in pots because I can ensure they have excellent soil and I can move them around as needed. I’ve marked the two that are hybrids, the rest are heirlooms. I plant my tomatoes in big plastic pots (12-inches wides x 12-inches deep or more) with drainage holes. My potting soil is a mixture of garden soil and compost (see Composting 101 for slow and fast methods). It’s worked well in the past so I continue to do this. I put 1-4 plants per pot, depending on the expected size of each plant and the size of the pot. I use tomato cages for support and then add tall supports later as needed. Tomatoes like to be planted deep. I remove the leaves from the bottom half of the plant and submerge that in the soil. All the little “hairs” on a tomato stem are potential roots. Suckers and shoots can be removed and planted as new plants. Use rooting hormone if you like. Only save seeds from your healthiest, most robust heirlooms to ensure good plants next year. Always look up the type of tomato you are growing so you can anticipate it’s needs. Is it a bush or a vine? How long until the fruit is ready? Is it best grown outdoors or is a type the prefers the indoors? These are the basic questions to ask. I have a dumb question. You say you plant the tomatoes deep and I understand that part. But do you take them out of the plastic pot or plant them deep plastic pot and all. I’m asking because you mentioned moving them sometimes. I apologize for this dumb question. I have been to only one planting tomatoes seminar and found it fascinating. 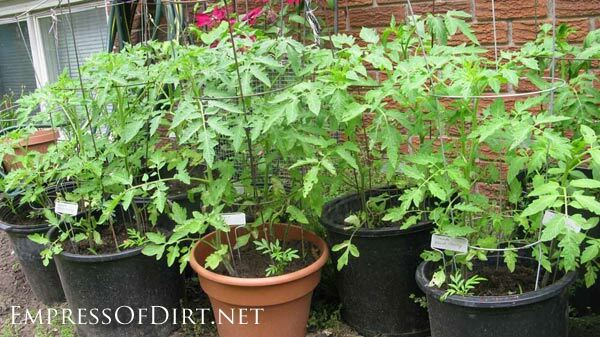 Hi Julie, When I wrote this post, I would plant the tomatoes in the ground without pots. Since writing it, I moved to a sandy garden and grow all my tomatoes in large containers, which are fairly easy to move around. I hope this helps. If not, feel free to ask more questions. Thank you for your nice article and could you kindly tell me what you use instead of fertilizer ? I just use compost in the soil. Have you found that your container tomatoes like to be constantly moist, or prefer to dry between waterings? Do you feed during the growing season? And I’m not sure what you mean by ” pruning”. Do I cut out a lot of the healthy leaves in the center of the plant? Also, four plants to a container does not get root bound or inhibit fruiting in any way? I only have sun on my deck so I move around in containers to follow it, also, I have found, like you, that I have a lot better soil in my containers than in my clay garden. The only thing I have noticed is that the plants don’t seem to grow as big and as fast than my neighbor’s who has put hers in the ground! 1. I water when the soil looks dry. 2. Prune – remove some non-fruit bearing stems. 3. I’ve not had a problem with crowding. I get a LOT of tomatoes. 4. Size doesn’t matter – the quality and quantity of the fruit does. I’m very happy with how I grow mine. There are many other ways to do it successfully as well. Well thank you very much for your concise reply, Melissa. I was wondering with what and how often you recommend fertilizing your containers, and then my questions are done! I’m hoping to get a lot more tomatoes this year from my determinate and indeterminate plants! And thanks for your valuable info.